FLIGBY is an advanced game-based people analytics tool. Exercise Values-led Leadership and discover your real Personal Profile! The content and the decision structure of FLIGBY have been designed to test, measure and develop 29 leadership and management skills directly during the gameplay. 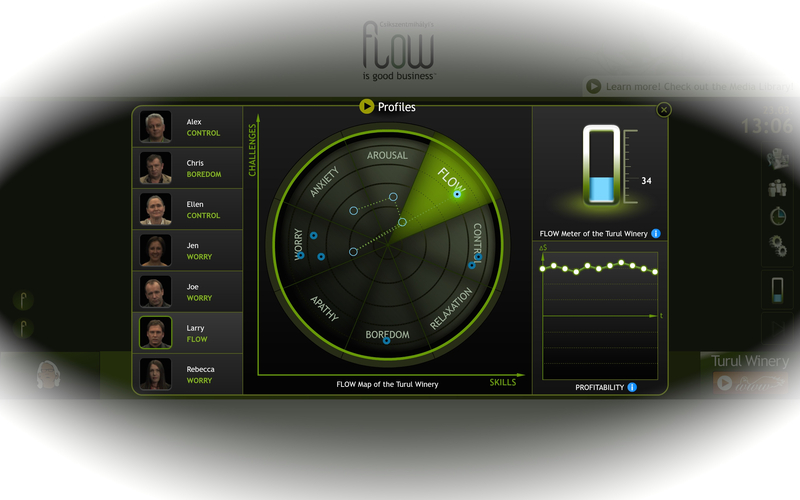 As an output of the game-based people analytics, players are given detailed feedback on the current state of their skills in the form of a Personal Report. At the same time, each skill is automatically also benchmarked against the average of the player’s cohort. FLIGBY’s own “skillset” measurements can be easily adapted (translated) into any organization’s own competency system. The main advantage of FLIGBY’s game-based approach is the unbiased nature of its measurements as compared with the typically biased other measures generated via standard surveys. Playing FLIGBY is so absorbing, and how a player’s leadership skills will be measured is so hidden, that there is no way “to game” the skill outcomes. Since the publication of FLIGBY’s game-based people analytics we collected data and tested thousands of players’ leadership/management skills. With different algorithms we can get insights about management and leadership capacities at the level of the entire organization, down to specific employee clusters, and further down to the level of individual participants. The data is stored in FLIGBY “MAP” (Master Analytics Profiler). Knowledge of the skill-levels can be especially useful for predictive-analysis. This new, analytical approach is employed when an organization faces (or might soon be facing) a new challenge, which suggests that certain managerial/leadership/strategic skills are particularly valuable to successfully manage them. FLIGBY can help organizations build strategic skills in a timely, cost-effective and focused manner. By analyzing the data stored in the MAP, organizations can accelerate their learning processes and understand career patterns of their successful leaders. Having a deeper understanding of the actual skill set, those in charge of human resource management can tailor the organization’s training and development programs by building on the true strengths on their employees. Take your Tour around FLIGBY’s Reporting Module!